and recreate Clive Palmer’s controversial ‘Make Australia Great’ ads. 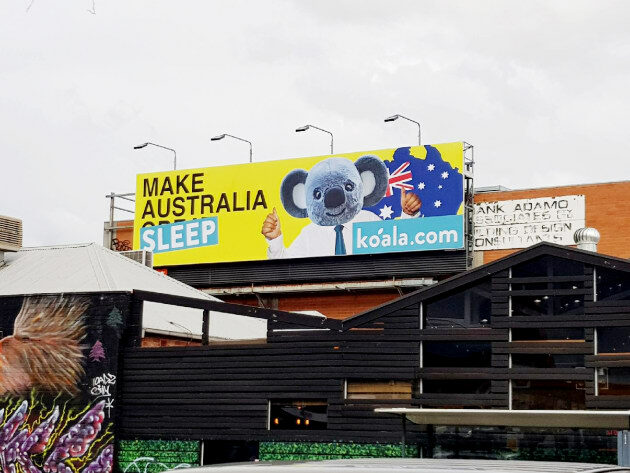 Up until 12 months ago when the Australian startup started exploring outdoor advertising, Koala Mattresses relied heavily on digital advertising, specifically retargeting. For head of marketing Tim Doyle, its foray into outdoor ads had to generate digital buzz to tap into the digital DNA of the brand. 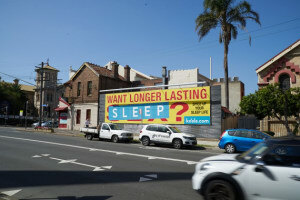 “The reason we like statement billboards is our audience is an online dominant audience so you aren’t going to get a huge amount of reach by going with a frequency based outdoor buy but if you have a bit of fun with a billboard and make it live online it has a huge amount of value in that sense and we’ve had great results from that,” Doyle says. “We’re a digital only brand. I don’t buy into the divide between digital and online marketing. Everything to us is digital and even if we buy TV, we are looking at how it drives visits to our website so we can retarget those potential customers. Each billboard is created to be “shareable” and is turned into a Facebook ad and targeted at new consumers, Doyle explains. 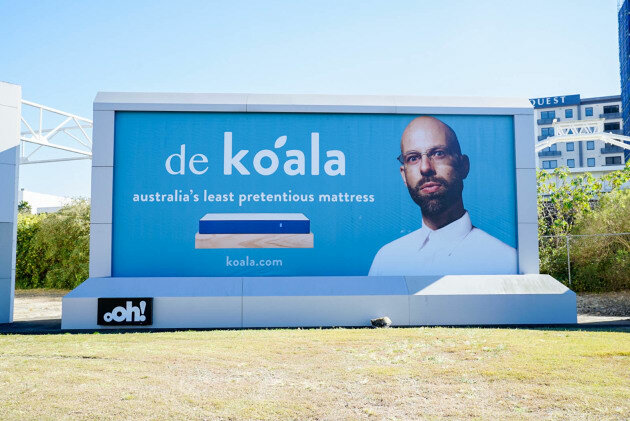 Koala’s cheeky billboards first captured Australians' attention last year when it launched a spoof campaign of the infamous De Rucci campaigns posted around Sydney airport. Founded by childhood friends Mitchell Taylor (30) and Dany Milham (27), the online retailer has gone from selling just mattresses to now furniture aimed at young Australian renters. Its annual turnover last year was $45 million, following the brand’s expansion into Asia. It’s had several investor rounds, raising $15 million last January. Former Australian test cricket captain Steve Smith is also an investor. In its latest billboard push includes a ‘NOFNIDEA’ Ikea-themed billboard, a spoof on the erectile dysfunction billboard and one that replaces Clive Palmer’s head with a koala. Essentially it’s recreating iconic advertising with its own messaging. In May this year, Koala also launched its first TV campaign, created in-house by its marketing and creative team. Doyle says the TV campaign had an “enormous and immediate” uplift for Koala. “Our approach to TV is probably a little bit different to what you see on other brands. We don’t look for frequency. We look for really high quality, large audience spots like MasterChef, The Block and primetime sports. What we hope is we drive people to the site the first time and get our frequency from retargeting them across our social network and display,” Doyle says. 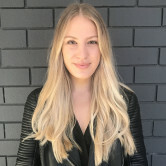 Koala has opted to create all its own content in-house rather than outsource to a creative agency as Doyle believes this drives a stronger link between the brand and the consumer. “One of the things we do best is having our creative and performance team work together. So the people buying Facebook ads are making the creative so there’s a nice feedback loop from customer to performance to creative so we can generate things at a high pace and get quick feedback,” Doyle says. As for what’s next for Koala, Doyle says it will continue to disrupt the furniture market where he believes there are still “no high quality digital experiences”. He also admits the brand has “neglected” publisher partnerships in the past and will look at inking deals in this space in the near future. “We see return when we take risks creatively and push our message out there so there will be a lot more edgier creative," Doyle says. "The channels we play in are agnostic so TV has a role to play, so does Instagram and we are bullish on YouTube, which I view as the next great customer acquisition channel. Expect to see more video content because that’s where you have to be really good." From Clive Palmer to Ikea, no one is safe from the irreverent advertising by Koala Mattresses. The Australian furniture startup has posted a series of billboards that mock competitor Ikea and recreate Clive Palmer’s controversial ‘Make Australia Great’ ads.